The travel and tourism industry, over the past couple of years has made significant strides to adopt new and innovative technologies like NFC, QR codes, iBeacon technology and Augmented Reality among many others. Such connected technologies are helping reshape passenger experiences at airports as well. According to MediaPost, more than one third of airlines worldwide have already invested in IoT solutions and more than half of all airlines are expected to have IoT initiatives up and running in the next three years. The use of smartphones and connected devices by today’s tech savvy passengers is also fuelling the growth of smart airports. According to ‘The Future is Connected’ report by SITA, 83% of passengers carry smartphones; given this, it is imperative that airports and airline operators connect with passengers through their smartphones. iBeacon based proximity marketing is one such technology helping create enhanced end-to-end experiences at airports, seamlessly through passengers smartphones. Beacons help in enhancing a wide variety of functions like wayfinding, flight information, baggage collection, measuring the distance to the gate, offering loyalty programs and conveying duty-free promotions among others. Beacons also act as an additional channel to increase revenues from non-airline related streams. Given the huge promise of iBeacon technology, leading airports across the globe have already invested in the technology. We have compiled a list of 10 airports that are leveraging iBeacon technology in order to deliver enhanced passenger experiences and improve operational efficiency. The Côte d’Azur Airport at Nice – Paris, recently launched a beacon-enabled app at the opening of its newly refurbished Terminal 1 retail area. The airport has installed several beacons across the terminal in order to send contextual retail information and promotions to passengers, based on their location in the terminal. The app automatically collects points when passengers belonging to the Airport Premium Club navigate through the airport. Beacons at the airport also facilitate access to Fast Track Security for the airport’s Premier Gold members, thus allowing them to use their frequent flyer card automatically. Unique proposition – Integrates the airport’s loyalty programs directly on the app. The app also allows store and restaurant discovery through it’s ‘Near Me’ feature. Unique proposition – The features of the app extend beyond the airport to include navigational assistance to and from the airport. Hong Kong was among the first airports in Asia to try Beacon technology . The airport has installed more than 50 beacons at Terminal 1 of the airport in order to trigger location relevant messages to passengers. As part of this initiative, the airport uses interactive navigation maps to guide passengers along common navigation paths such as public transport points, check-in counters, immigration, boarding/arrival gates and baggage claim areas. Unique proposition – Uses interactive and user friendly navigation maps to guide passengers across major areas of the airport. The HIAQatar app of Hamad International Airport aims to deliver immersive and connected experiences to passengers. The airport has installed 700 beacons across various areas of the airport in order support this initiative. Passengers at the airport will simply need to scan the boarding pass and opt-in for location detection in order to receive real-time information with regards to flight schedules, baggage claim and, boarding gates. Unique proposition – Provides passengers with alerts about the latest promotions directly on their smartphones, as they walk past the duty free stores of the airport. The CSIA Airport at Mumbai launched India’s most advanced airport navigation app supported through iBeacon technology and Augmented Reality. The app is built to help passengers with interactive navigation assistance and also allows passengers to easily look up any section, store or restaurant with just one click. Passengers can also select their flight on the app, in order to receive relevant information with regards to the flight. Japan Airlines has installed beacons at the Tokyo Haneda airport in order to trigger location relevant information on nearby devices. The airline has provided its staff with smartwatches in order to support the initiative. The beacons along with smartwatches will help identify the exact location of staff in order to assign and communicate tasks specific to his/her location in the airport. This unique initiative makes Japan Airlines the first airline to use beacons to improve the operational efficiency of staff. 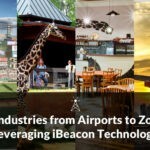 Unique proposition: Use of beacons for precise resource allocation in order to improve the airport’s operational efficiency. Bologna Airport aims to improve the quality of its passenger services by using many innovative new technologies like iBeacon, NFC and QR codes. These technologies will work together to provide passengers with enhanced experiences at the airport through real-time alerts, notifications and promotions. Unique proposition – Use of multiple technologies in order to create a seamless experience. British Airways has rolled out an iBeacon initiative at Terminals 3 and 5 of Heathrow Airport. Passengers using the the British Airways app will receive relevant notifications about flight schedules and flight boarding information. The app will also send a personalised welcome message to passengers when they arrive at the airport lounge. Unique proposition – Leverages the app to convey the Wi-Fi details for using the airport’s free Wi-Fi network. Being a busy airport, the John F. Kennedy Airport at New York is leveraging iBeacon technology with the intention of making passenger experiences more convenient by conveying actual wait times at queues in the airport. This solution is currently available in Terminal 4 of the airport and provides actual processing time for passengers waiting in the security and customs queues. The beacons also helps in precise staff allocation in relation to the crowd at the terminal. The terminal has also installed special display monitors at specific locations, such as, TSA security, checkpoint, indoor taxi queue and Customs and Border Protection areas. These boards constantly broadcast the exact wait time, in order to benefit passengers without smartphones. Unique proposition – Use of special display boards to convey wait times, in addition to smartphone notifications. San Francisco Airport has installed 500 beacons with the intention of not only helping passengers, but also the visually challenged passengers at the airport. Passengers received relevant notifications as they walked through the airport. They can also easily search for flight gates, information desks, ATMs and power outlets directly through the app on their smartphones. Unique proposition – The beacon-enabled app integrates with Apple’s Voiceover technology to assist the visually challenged easily navigate the airport through their smartphones. Players in the aviation industry are currently only scratching the surface with regards to beacons and IoT. It is only a matter of time before beacons become mainstream to airport infrastructure. Industry players are also experimenting with Eddystone beacons in order to remove the need for multiple airport/airline apps. Moving forward, the focus will be on providing completely connected travel experiences that not only connects passengers inside the airport but also around the city, like providing taxi assistance and city navigation among others.